It’s Thursday afternoon, and my “work day” consists of this and only this. Upvote an entry. Hit “refresh” again. Comment on another entry. Hit “refresh” again. Take a sip of water. Hit “refresh” again. It’s been 3 days. All client work has been pushed aside. I’m not even pretending to do an actual copywriting at this point. 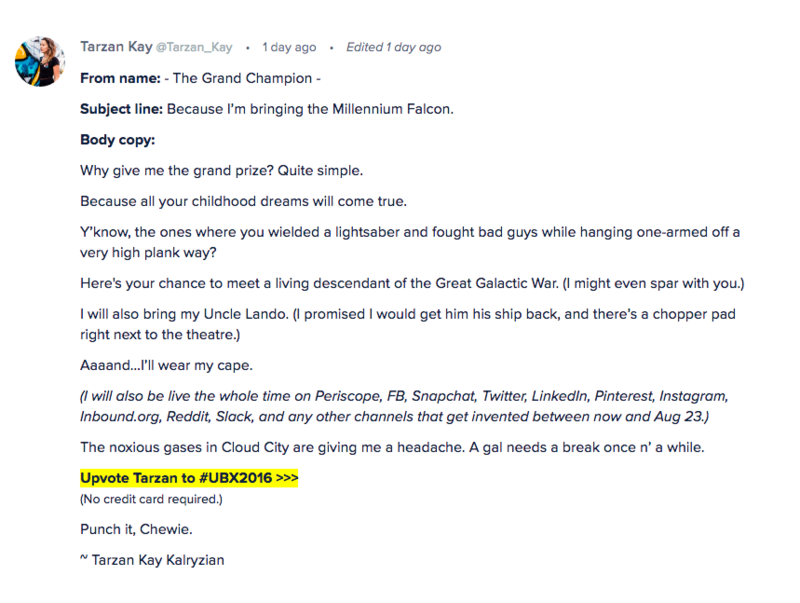 When I win this, it’ll be worth it. This is my moment. And I’m going all in. 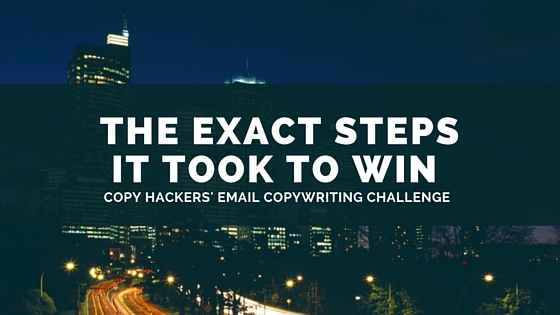 When I read about Copy Hackers Email Copywriting Challenge, my lizard brain immediately provided me with a list of reasons why it was not for me. I wouldn’t win, so why bother? I joined the FB group anyway, just to lurk. Who am I to argue with cosmic messages? And so 2 days before the start of the competition, I introduced myself to the group, making particular note that I would very much like to win the grand prize. Then I set to work on a strategy. Here’s what worked, and what didn’t work. 1. I figured out exactly what it would take to win. In the book Good To Great, Jim Collins tells how his wife casually announced one morning that she could win the Ironman challenge. Without a trace of ego. It was a simple statement that she understood what it would take to win, and the steps she would take to get there. So, I asked myself. What will it take? On Day 1 I figured out 2 key things that proved to be the secret of success. In order to be a contender, I would have to (1) post EARLY, and (2) get at least 4 or 5 votes to keep me top of the pile. If I could get myself top of the pile early in the day, I could get more organic votes from people who’d read and enjoyed the emails I wrote, had authenticated accounts and therefore counted for actual votes. Signing up was a HUGE barrier for a lot of people. Including mine. But I didn’t let it stop me. In this awesome post, Jay Cross talks about how, faced with even a tiny obstacle, most people backpedal. I wouldn’t let that be me. 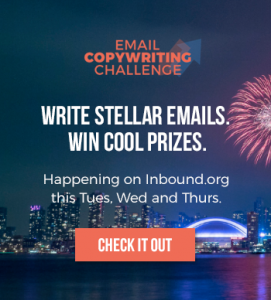 Inbound provided a sweet barrier that eliminated MOST of my competition for me, without me writing a single email. Bonus. I was off to a running start. 2. I offered real value + support, rather than being a self-promoter in disguise. A lot of FB groups are full of self-promoters in disguise. Fair enough. We’re all in it to meet new people, scope potential clients and learn from each other. I really didn’t want to be one of those people. Once I’d figured out a few key pieces that needed to be in place to win, I made sure to share them with everyone in the competition. It was helpful, sure, but again, I wanted to win on the strength of my writing, not because I had access to information that others did not. 3. I risked “annoying” my friends and gave them a good WHY. I’m fine with people asking me to vote for stuff, and I usually do it without a thought. But if there’s a sign-in process involved? Huge deal breaker. Foreseeing this barrier, I knew I had to do better than just ask people to vote. 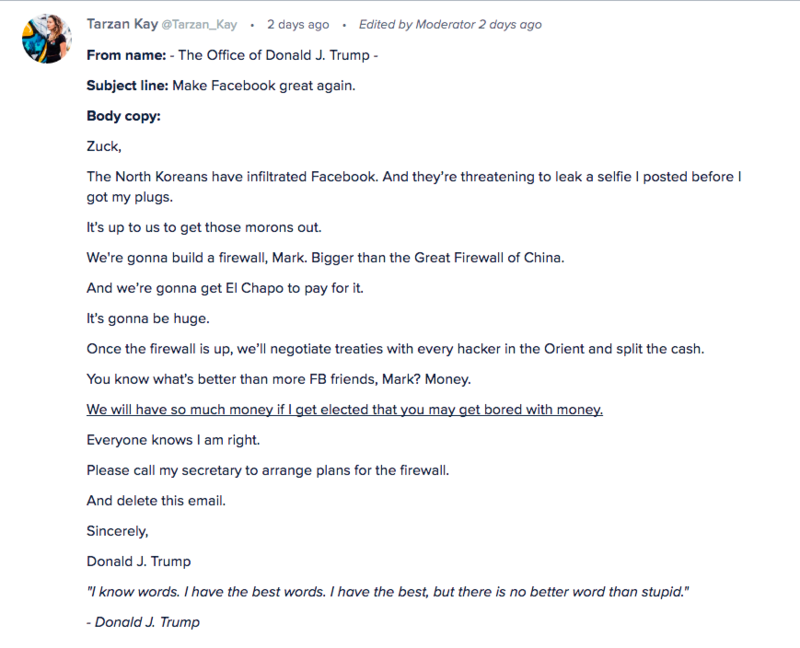 I started by endeavouring to deserve the vote, throwing down some killer emails that would actually inspire people to vote, even though it was a pain to do so. If I had a do-over, I’d make a short video with a screen capture of me logging in and voting. I’d also do up a quick FB cover photo instructing people how to vote. There were lots of people who WANTED to vote, but couldn’t figure out how to do it, and got too frustrated in the process. 4. I emailed my list and asked them to tweet about it. Rather than flat out asking them to vote for me (which didn’t seem fair given that I was writing the email before the challenge even started), I gave them the choice to either participate, or tweet out their support—a technique I learned from Copy Hackers. The second option was a 1-click way to show support, and contrasting that with signing up and voting made it look that much easier. The competition has barely started when a few tweets like this started popping up on Twitter. You’ll notice I made sure to tag one of the judges in these pre-programmed tweets, so they’d see I was bringing out support for the competition. I was rewarded with a retweet from Copy Hackers, which gave me a huge confidence boost—exactly what I needed early in the game. 5. I put all the spiritual + emotional pieces in place. I let him know I might be a little extra busy this week, and possibly a wee bit distracted even after work. A wee bit turned out to be a big understatement. Next, I called on my muse, wrote her a little poem and made a graphic on Canva—yes, it took some time, but she rewarded me with a strong opener and 2 top-voted emails, all of which were written in under 30 minutes. I also tapped with Brad Yates on “You Are A Winner”. I turn to Brad for almost every spiritual, physical and financial challenge that life throws at me and he never disappoints. Lastly, I talked with my coach Kathleen Milligan every day. She helped me keep my head in the game. I also strategized with my hunny after each day, meditated on winning, put a special concoction from the magic shop in my diffuser at the office (leftover from another HUGE month in my business). Everything I had in my bag o’ tricks came out in support of this win. 6. At the risk of sounding like a braggart, I also threw down some pretty stellar email copywriting. Here are all 3 of my entries in the competition. 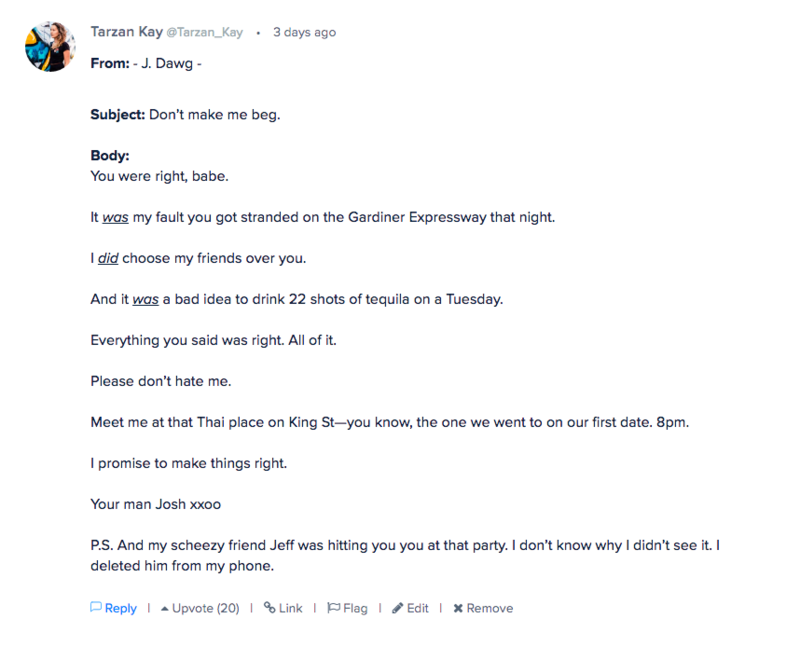 Challenge # 1: Write an email that sells your “ex” on going out for a romantic dinner with you tonight. Just the two of you. Finally, there were 2 things that didn’t work. Posting on LinkedIn got no traction at all. I have a few hundy connections, and they’re moderately supportive when I post articles, but it just didn’t feel like the right space to talk about the challenge. And sure enough, nothing I posted generated interest. Trying to do client work at the same time only added stress and wasted precious hours. If I had a do-over, I’d clear my schedule and devote myself 100% to winning. That’s a lot, I know. But all I had to lose was 3 days. And I learned a ton along the way, and made plenty of great connections to make it worthwhile. Would I’ve been completely crushed if I didn’t win? You betcha I would’ve. But I’d have gotten over that. In the grand scheme of things, there wasn’t much risk involved. It was only my ego at stake. Win or no win, those fringe benefits probably would’ve arrived anyway. And they would’ve been worth it. 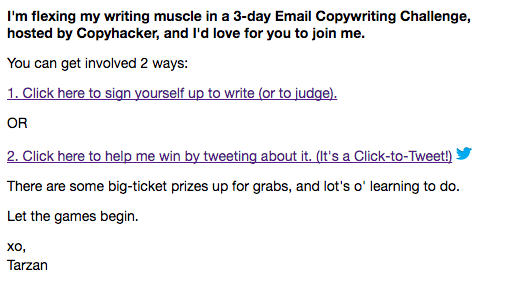 Whenever I visit Copy Hackers I’m reminded how much more I have to learn about copywriting. 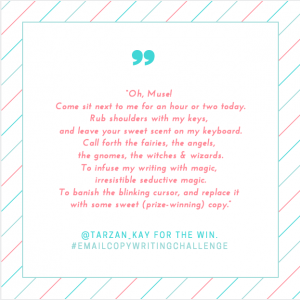 I’m flattered and honoured by all the attention the email copywriting challenge brought me, and now I’m endeavouring to deserve it over and over every single day. Wanna stay in touch, hear what happens at Uberflip, or just come along for the ride?